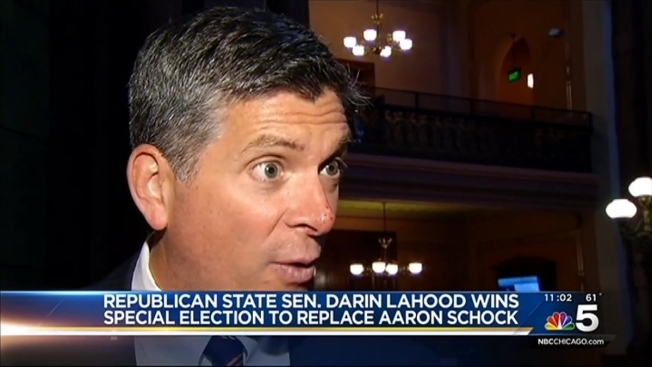 Republican state Sen. Darin LaHood, the son of former U.S. Transportation Secretary Ray LaHood, easily captured Thursday's special election to replace disgraced former U.S. Rep. Aaron Schock, sending a familiar name to Washington, D.C., from Illinois. The contest brings the number of U.S. House members back to 435 and comes after Schock resigned in the middle of a spending scandal that included his redecorating his congressional office in the style of television drama "Downton Abbey." It was unclear how soon Darin LaHood would be able to take office, which requires several procedural steps, including resigning his state Senate seat. The former prosecutor had the overwhelming advantage over Democratic high school teacher Rob Mellon in the reliably Republican territory that touches 19 counties in central Illinois. In addition to name recognition, he had party backing, key endorsements and amassed roughly $1.2 million, compared with Mellon's approximately $10,700. LaHood played up his area roots and tried to distinguish himself as more conservative than his father, a longtime congressman who worked in Obama's Cabinet from 2009 to 2013. "When you talk to people in the district, there's a real disconnect between what goes on in Washington, D.C., and the rest of the country," he said ahead of the election. "People, they want the country to move forward. They're upset with the paralysis with what has not gone on in D.C."
Much of the shortened campaign season, with a handful of debates, focused on the economy. Voters also expressed frustration with the Schock scandal. Schock, once a rising star Republican, abruptly stepped down after reports questioning his use of taxpayer money, including global travels documented on social media, mileage reports and concert tickets for employees. Federal authorities have since subpoenaed records, and former employees have testified before a grand jury. Turnout was light Thursday, with some county clerks saying the number of voters wouldn't reach the level of the primary. In July, roughly 11 percent of eligible voters districtwide cast ballots. Mellon, a U.S. history teacher who campaigned when not in school, said his major themes included income inequality and campaign finance. He vowed not to take in more than $150,000, though acknowledged he'd have a hard time getting there anyway. "I did not anticipate raising much money," he said. "The entire country needs politicians who are kind of unfettered, who aren't tied to the strings to all of these donations and special interests." He said he was targeting his effort toward union votes and possibly disgruntled Republicans.